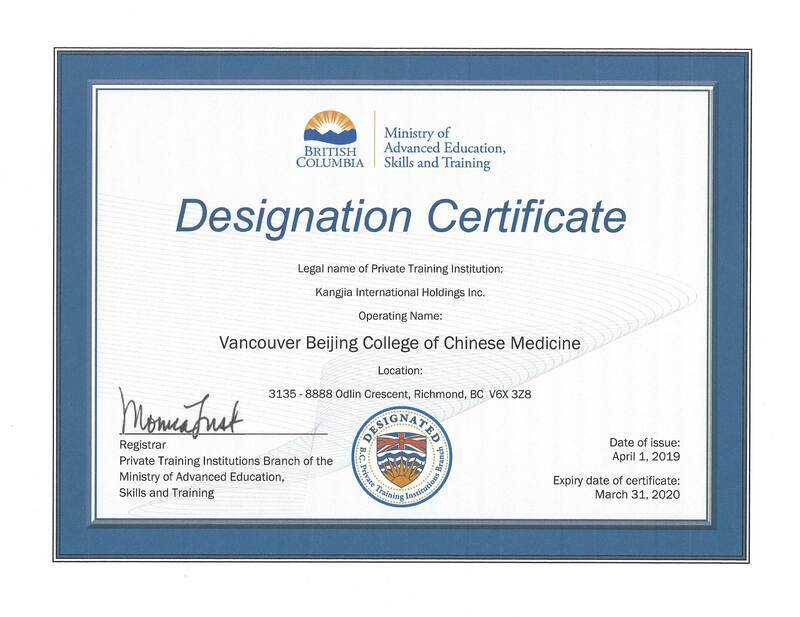 All the applications need to be 19 years or older prior to the program start in order to enroll with Vancouver Beijing College of Chinese Medicine (VBCOCM). Effective December 28, 2009: ALL applicants for registration are required to fulfill this requirement. Previously a similar requirement was included in Schedule E; it applied only to BC	students and included equivalent courses or ‘transferable’ credits. The current	requirement applies to ALL applicants and refers only to university courses in liberal arts/sciences. No applicants will be accepted to write the CTCMA competency examinations without this requirement. A completed VBCOCM application form. To get a copy of our application, you may contact us and have an application mailed to you. An application fee of $150.00 for Canadian students and $250.00 for international students ($Can). $150 is non- refundable. Please make your check or money order payable to VBCOCM. The application fee includes the administrative charge, admissions testing, assessment fee and the cost of duplicate income tax receipts, certificates, diplomas, and course outlines, which are not credited to the tuition. Two written references from teachers or employers supporting your application. Official transcripts of your marks from each educational institution attended. Please send your completed application to VBCOCM #3135-8888 Odlin Crest. Richmond V6X 3Z8. A notice of admission will be mailed to the accepted applicant as early as possible. One academic year consists of 12 months. Full-time students attend classes at least 10 hours per week. Both full-time and part-time programs are available. Starting from the first week of January each year, credit courses are available for first-year student. These courses are provided to assist student who want to get a head start and to lighten the workload of the academic year. If you are interested in this option, contact the college for further information. We also offer summer courses starting May each year and an intensive Training Course to suit part time students, classes will be held in the evenings and weekends.